Growing vegetables and fruits in the home garden is rewarding, but many people are put off by the backbreaking work involved at the start of the growing season. Perennial edibles are the answer to this problem. 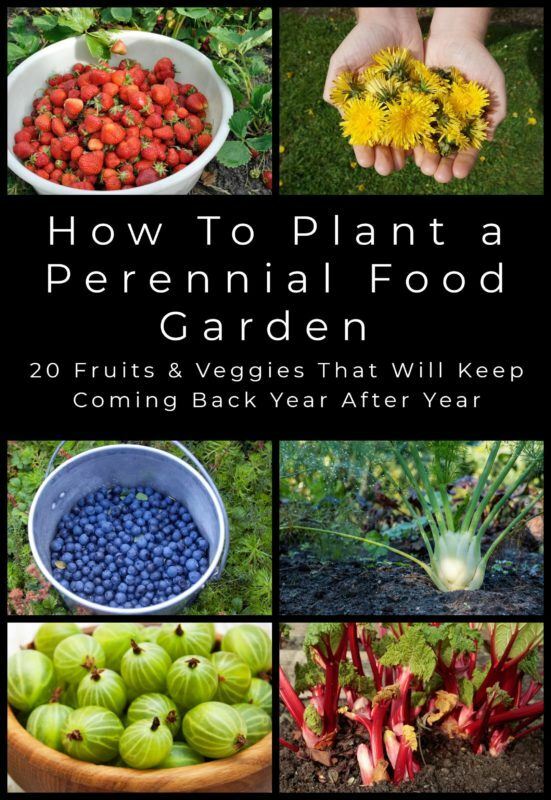 Grow them among your regular veggies so that you will have something to look forward to even if you miss your spring or fall planting. Once planted and established, they require very little work except topdressing and occasional weeding and pruning. 1. Select the varieties that are guaranteed to do well in your USDA zone and the microclimate in your garden. 2. Plant them interspersed with your annuals so that your garden is uniformly filled out throughout the year. 3. Prepare the planting spot very well since you will be letting them grow there undisturbed for many years. 4. Leave plenty of space between perennials as they will multiply faster than you think. 5. Plant only a few at a time so that you have better control over them if they turn out to be invasive or fall short of expectations. Here’s a selection of edibles that will reward you with repeated harvest for several years to come. Asparagus is one true perennial vegetable that will reliably come year after year. Although it is a seasonal vegetable when grown outside in the garden, the expanding mound can be harvested for over 20 years. The culinary type Asparagus officinalis can be grown from seeds, but you’ll have to wait 2-3 years to get spears worth the table. It is better to buy one or two year old crowns of hybrid varieties or get divisions from someone having clumps of male plants. Asparagus is a cool-loving plant hardy to USDA zone 4. There are a few cultivars such as UC 157 and Jersey Knight that can be grown in warmer areas. Grow this prized vegetable in well drained slightly alkaline next to where tomatoes are planted since they are mutually beneficial companions. Globe Artichoke Cynara cardunculus is a Mediterranean native thriving in warm climates. If you live in USDA 7 and above, you can grow this thistle relative as an annual and harvest the edible flower buds from spring to mid fall. When grown from seeds, the flower buds are produced in the second year and for 3-4 years afterwards. Alternatively, root cuttings from established plants or ready–to-plant starts you can get from garden centers or online can be used as planting material. Allow plenty of room in a sunny location for the plant to grow and spread. Regular watering and feeding, especially with a potash fertilizer at the time of bud formation will ensure large flower buds. Divide the clumps every 3-4 years to promote vigorous growth. This American native Helianthus tuberosus has a misleading common name. It has nothing to do with Jerusalem and is only distantly related to globe artichoke, although the edible tubers have a similar taste. Also known by more suitable names such as sun artichoke and sunchoke, this plant closely related to garden sunflower were widely used by Native Americans. The tubers are starch-free and rich in the dietary fiber inulin known for its cholesterol lowering and chemo-protective ability. Inulin is great for gastrointestinal health as it aids the growth of beneficial bacteria in the guts. This sun loving plant is easy to grow almost anywhere and produce large quantities of tubers every year, so plant only a few. Tree onions (Allium cepa var. proliferum) are a variety of regular onions that develop a bunch of bulbs on the flower stalks. When these topsets grow bigger, the stalks bend until they touch the ground, starting new plants a little away from the parent plant. This has earned them the common name ‘walking onion.’ These easy-to-grow and easy-to-harvest onions are a great asset to any edible garden. Not only the top sets, but the leaves and the underground bulbs can be eaten, but the latter is tougher and more pungent than regular onions. To plant these onions you can either divide a clump or use the topsets. Plant them any time of the year, even in winter if the ground doesn’t freeze. They are now considered a hybrid of regular onion with perennial Welsh onion. If you have some water in your garden, watercress Nasturtium officinale is a great perennial to have. Grow it from seeds or start with a single clump, and you will soon end up having plenty for your use and for giving away. When you buy watercress, you get whole clumps with or without roots, but in your garden you will be harvesting only a few leaves from each clump. They will grow back quickly, ensuring a continuous supply. The crisp, peppery leaves are great in salads and are the most nutrient dense food you can grow at home. You can cook them too, but it mellows the taste. Rhubarb (Rheum rhabarbarum) is one of the first perennials to come up in spring. This is a plant for cooler regions since it cannot withstand heat above 90F. Well-drained soil amended with rich manure is ideal for growing this vegetable. 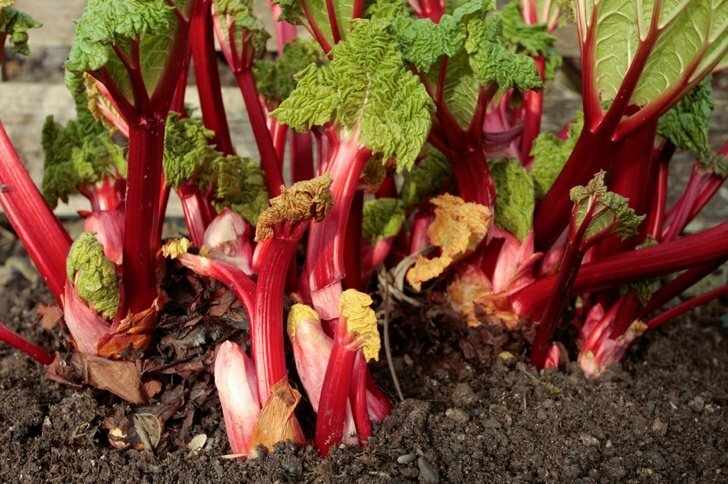 Sections of rhubarb roots should be planted in early spring and the soil kept moist. Since the clumps can grow 3-4 feet across, sufficient spacing is essential. The rhubarb can be harvested from second year onwards and for the next 2-3 years, but may need to be divided after that. These plants are quite tough and take some amount of neglect, but they respond well to good care. Daylilies (Hemerocallis) are treated as perennials in the flower garden. Although most gardeners know that these flowers are edible, they are rarely used as vegetables like the Chinese do. Not only the flowers and flower buds, but the thick roots that look like fingerling potatoes and the white, tender base of the stalk are edible. Spare the prized varieties, but leave the common ones like Hemerocallis fulva for culinary use. Stir fry or batter fry the flower buds; boil the larger roots and eat the lighter ones raw; add the chopped stems to soups. Try in small amounts first to make sure that you are not allergic. The tender fronds of many ferns known as fiddleheads are eaten when they are tightly coiled, but they are often gathered from the wild, depleting the wild stock and occasionally gathering toxic ones by mistake. Growing your own solves these problems. North American species Matteuccia struthiopteris, commonly known as ostrich fern, is worth growing in damp spots in your garden. It does especially well in USDA zone 3 to 7 and will supply you with fiddleheads every spring if you take care to harvest less than half the fronds that come up. Buy one or two plants from a reliable supplier rather than trying to grow them from spores. This legume Phaseolus coccineus is often grown as an ornamental for its bright red flowers, but the edible beans are excellent as a vegetable. They can be cooked as snap beans when tender, and shelled when they are plump with seeds. The dry pods can be harvested for dry beans. Add the edible flowers to salads and stir fries for color. Once started from seeds, scarlet runner bean plants can grow as perennials in warmer areas, and can be overwintered in colder areas by cutting off the top growth and mulching. In spring, new stems will emerge from the underground parts. This is a neglected perennial legume despite having the potential to become a survival crop. Although native to North America, potato bean Apios americana is now mainly grown in Japan. However, it grows wild in moist areas across USDA zones 4 to 9. The potato bean vine produces strings of small tubers underground and bean-like pods above the ground. It is also known as American groundnut after its tubers. The beans and the tubers are both edible and nutritious, and have high protein content. The plants can be started from both seeds and tubers. It spreads by tubers and keeps coming back more vigorously every year, so find out if the plant is invasive in your area before planting it in the ground. They are used in curries and breads. The feathery leaves look like dill, and can be used as an herb to flavor dishes. The leaf stalks can be cut off every now and then and used like celery. Finally, the bulbous leaf bases are used as a vegetable, either raw or sautéed or stir fried. Fennel grown in poor soil has better flavor. You can grow it from seeds as a perennial in USDA zones 5-10, but it is treated as an annual in colder areas. Sweet potatos are usually grown as annuals in cooler climates, but the vine can live as a perennial in the same spot for years in warmer areas. Rooting from nodes, the plant can spread very fast and fill large areas until actively contained. Not only the tubers, but the leaves are also edible. The tender shoots with 2-4 leaves can be cooked like spinach. Grow sweet potatoes from rooted cuttings you get from garden centers, or make your own planting material by allowing the tubers to sprout and put out many runners. Although sweet potato vine can grow in poor soil, it gives plentiful harvest if the soil is loose and fertile. Dandelions are obviously perennial since they come up in the same spot in the lawn despite your best efforts to get rid of them. That makes them good candidates for a perennial edible landscape. The young leaves can be eaten raw in salads and the older ones cooked as a vegetable. The root as well as the flowers can be used for making dandelion tea which has anti-inflammatory and diuretic properties. Since dandelions grow in almost all USDA zones as a weed, sourcing planting material is not difficult. Grow them from seeds or dig up plants from places you don’t want them to grow. To prevent new dandelion plants from sprouting all over the garden, harvest all flowers before they get a chance to set seeds. The common garden sorrel Rumex acetosa is a leafy vegetable with a lemony zing that deserves a place in every edible landscape in USDA zones 4 to 9. This cold hardy perennial can withstand a few frosts, but eventually dies down, only to resurrect early in the spring in a rosette of tender green leaves. They can be eaten raw in salads and sandwiches. Sorrel soup is another delicacy. Plant seedlings in spring and start enjoying the leaves once the plants are well established. Sorrel patches spread rather quickly, so start with only a few. Cut off the stalks when the plant bolts to prevent seedlings coming up all over the garden. A strawberry patch in the garden can give you plentiful harvest for several years if you just keep the plants mulched and prevent overcrowding. You can choose seasonal varieties for heavy yield or everbearing ones for staggered production. Strawberry plants love sunny areas with rich, slightly acidic soil. If you don’t have sunny spots in your garden, you can grow woodland strawberry (Fragaria vesca) which does well in partial shade. These spiny plants that grow delicate looking, translucent berries are a must-have for any edible garden in the temperate world. They are cold hardy to USDA zone 3, but don’t do very well in high summer temperatures. Plant rooted cuttings 6-feet apart to provide adequate space for their arching canes. Gooseberry bushes love rich, well-drained soil. Regular watering and feeding with potassium fertilizers and top dressing with dolomite limestone give good results. Regular pruning keeps the bushes healthy and neat, besides producing bigger berries. American gooseberry Ribes hirtellum has better yield, but gives smaller fruits while the European variety Ribes grossularia has larger, flavorful berries. Coming in black (Ribes nigrum) and red (Ribes rubrum) varieties and the albino version of red, currants are easy-to-grow perennial fruit for edible gardens. These cold hardy plants do very well in sunny locations in cooler areas and in partial shade in warmer places and reliably produce fruit every year from the second year of planting. They are generally grown from cuttings, and prefer moist, slightly acidic soil. Once the plants are established, all you have to do is prune them every year to keep the bushes under control and to promote new growth. The tart and sweet fruit can be used in a variety of dishes and made into jams and jellies. Also called Buffalo currant, Jostaberry (Ribes aureum) is a mix of gooseberry and black currants. It combines the best of both parents and gives you sweeter berries on spineless canes. What’s more: it is resistant to the diseases affecting the parent species. When grown in rich, moist soil from rooted cuttings, the plants grow vigorously and start producing fruit in 2-3 years. You need quite a bit of space to accommodate these large bushes, but they are self fertile, so a single bush is enough. The berries can be used the same way you use blackcurrants. You have a wide choice when it comes to raspberries since both summer bearers and everbearing varieties that continue to produce fruit from spring to fall are available. Then there are purple raspberries, red raspberries, and their albino versions, known as golden raspberries, to choose from. You can find different cultivars that do well in USDA zones 3 to 10. Plant rooted cuttings of the variety of your choice in spring. You can have several types depending on space and zone limitations, but plant them at least 6-8 feet apart. Each plant will put up an increasing number of long canes every year. Rich soil and regular feeding give great results. This North American native deserves to be part of every edible garden. Once established, a blueberry plant can provide berries for several decades, but many cultivars are self-sterile and require more than one plant to ensure fruit production. You can choose between lowbush Vaccinium angustifolium and highbush Vaccinium corymbosum and its hybrid varieties. Blueberry bushes are acid-loving; they grow best in soils with pH 5. It should be evenly moist and well drained. Occasional pruning keeps the bushes healthy. For warmer climates (USDA zone 7-10), the tall growing Rabbiteye blueberry (Vaccinium ashei ) may be ideal. Happy planting and healthy eating!